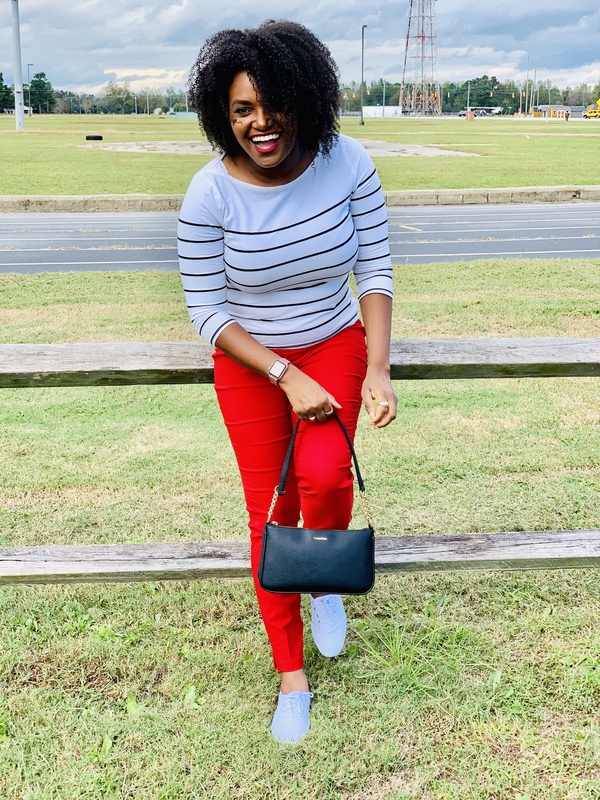 Red, White and Stripes – Shanna C.
Over the past couple of years, I have tried to add color to my wardrobe. I think this year I have added the most color. It all started with this style of pant. These pants are high-wasted, a little stretchy, and slim ankle. They must have me in mind when they designed these pants because the most important part of clothing is comfort. These pants provide an exponential dose of comfort. They move with you and not against you! I can bend; stretch, and sit crisscross apple sauce (teacher language). 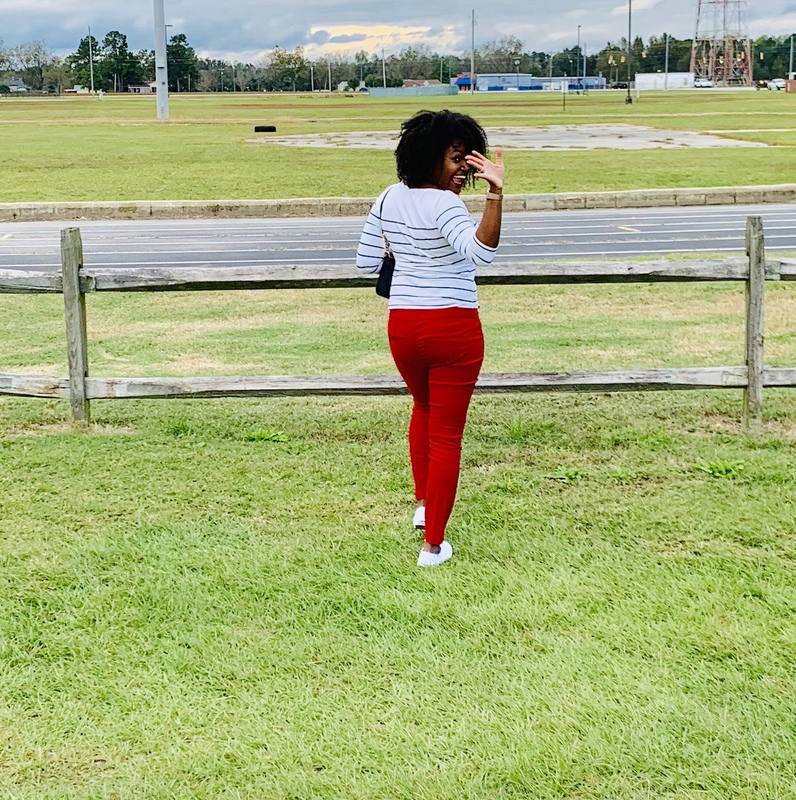 So, when I first purchased these pants from New York and Company, I only selected five pair. I purchased them in navy, wine, black (2 pair), and pink. At that point, I was thought I was crazy for spending so much at once on pants. After wearing them everyday for almost two and a half months, I decided I had to go back. I had to get the rest of those pants. When I first bought, there was a small selection. So, I went to the store with then intention of purchasing the two pair that was left. Unbeknownst to me, New York and Company had added almost five to ten different shades and patterns of this same exact style of pant. I thought to myself how was I going to choose between the different shades and patterns. Turns out I didn’t have to choose, I could buy them all…right? Right! I purchased the red pair in the photos. I purchased a green pair, another black pair, two plaid pairs (one with a bit of blue and one with a bit of pink), I purchased a purple pair, and I purchased a burgundy pair with a random print. All in all, I think I purchased twelve versions of the same pant, if my addition is correct. So, be on the look out for these pants because they will be thoroughly incorporated into my wardrobe (casual and work wear). 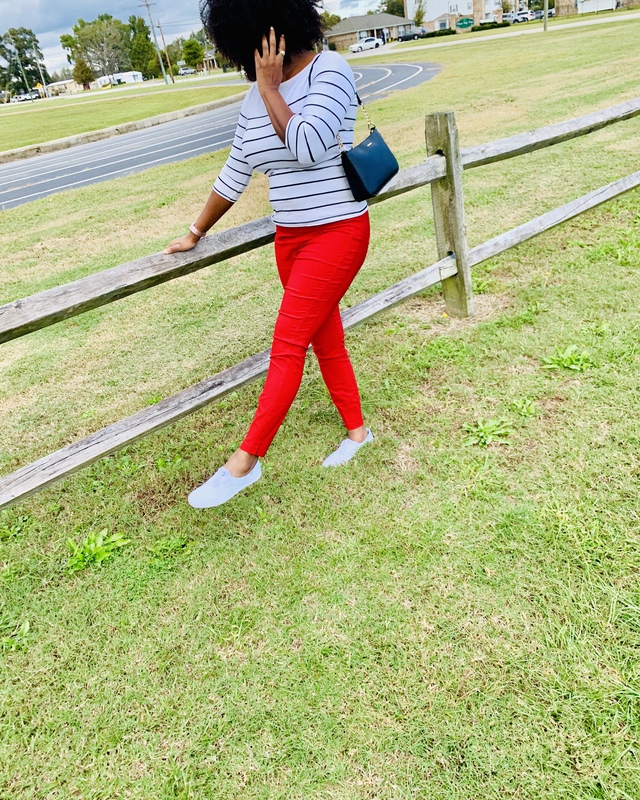 One thing I enjoy about these pants is the versatility. I can wear these pants in winter, spring, summer, and/or fall. I will mix up the footwear and tops, to show their versatility. Expect to see them on blog a lot. I did borrow this style for Taylor Swift and her Keds campaigns. In her ads for Keds, she always created clean lines in her wardrobe. She wore ankle pants and nice tops (blouse and/or sweaters). I wanted to recreate those looks for my own personal style and I think I achieve the look. It makes getting dressed so much easier and I feel put together. Thanks Taylor, New York and Company, and Keds! Lol! Any outfit ideas shoot them my way!